No one can say that Molalla didn't put its best foot forward in its first league encounter with the North Marion squad on Wednesday, Jan. 18 at Capasso Court in Molalla High School. Molalla was neck and neck with the 11th ranked Huskies for the first half of play, but as has plagued them all year they could not put together a full game of consistent play. North Marion took over in the third quarter, and never looked back, winning 68-44 to get its first league win of the season. "Our biggest key was we wanted to get out in transition in this game," North Marion coach Tully Wagner said. "They were trying to slow the game down, they had a lot of long offensive possessions and we wanted to try and get out in transition, and I thought we did that well tonight. We made a couple mistakes but they were aggressive mistakes so we can live with those ones." Molalla didn't make it easy. In the first quarter Molalla jumped out to 10-5 lead, punctuated by a floater basket from senior Ben Daniels. At that point though, North Marion began to take over, slowly but surely. The visiting Huskies went on a 9-2 run to end the first quarter, finishing 14-12 over Molalla. "I thought we played hard," Molalla coach Jeff Bennet said. "Our effort was there, I thought our half-court offense was pretty good, especially considering the first half and the fourth quarter, so those are some bright moments to build on. We just have to work transition-wise. We still don't get any easy baskets. Once we kind of figure out how to get some easy baskets, that will be better for us." In the second quarter, North Marion took off, scoring 13 unanswered points with 5 points from senior Jared Hauser, 4 points from junior Sergio Jimenez, and 2 apiece from senior Sam Garcia and senior Grant Henry. Molalla rallied strong though, putting together a scoring streak of its own. The home team utilized its shooters from beyond the arc, knocking down four 3-point shots in a 14-4 run to end the first half. North Marion now led 32-26 after the first 16 minutes of play. Coming out in the second half though, the Huskies took over entirely. In what was the most decisive eight minutes of play, North Marion outscored the home team 20 points to 2. Only Molalla junior Derek Pederson scored, and was unsuccessful at the charity stripe. North Marion on the other hand had several players' record points in the third quarter, including but not limited to Jimenez (6), Grant Henry (4 points), junior Brady Hansen (3 points), Hauser (2 points), and junior Johnny Page (4 points). The key to that string of scoring was North Marion's unselfish passing and assists that led to quick points in transition. "That's what we love to see (assists)," Wagner said. "Ideally every basketball team doesn't care who scores, and when we're good, we do a really good job of that. Tonight, we scored two or three for North Marion, not for individuals. That's something that we always work on, and the guys really buy in. It's all about getting team wins, and we don't really care how that happens." "We always practice what we call 'circle movement' or 'cuts,' always looking for the open man, team first instead of individuals," Jimenez said of the teams passing. "If we have a guy open and they call for it, we give it to them. We have no other choice." By the end of the third quarter, North Marion led by an insurmountable 52-28. Molalla, to its credit, came out and played like the disastrous third quarter had not happened. The home team went basket for basket with the Huskies, equaling the away teams 16 points in the final stanza. Instead of attacking from beyond the arc, Molalla attacked inside, drawing fouls and hitting shots in the paint. North Marion never let the lead fall into danger though, and closed the game out strong with the scoreboard showing 68-44 at the final horn. North Marion followed that performance up with an even more dominant win over Madras 90-54 on Friday, Jan. 18. The Huskies (2-0 in TVC, 8-8 overall) will face Estacada (1-1 in TVC, 4-12 overall) in a home game on Tuesday, Jan. 22. 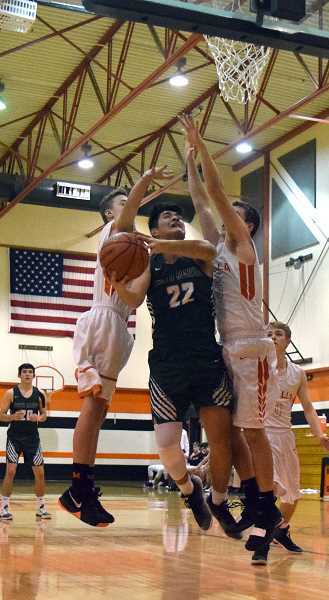 Molalla fell against Estacada in its next matchup 56-30, and will search for its second win on the season against Corbett (0-2 in TVC, 6-9 overall) on Jan. 22.